Brain Freeze on the Beach! What’s the best part of living in North Miami? Well, we are sure you could make a case for the sun, the water, and the people. And, you wouldn’t be wrong. But, we think that the icing on the cake, so to speak, is the fresh, creamy ice cream that we whip up everyday at Chill-N Nitrogen Ice Cream. Situated just off of Highway 1, we are conveniently located for your trip to the lake, the bay, or the beach — or, let’s be honest, on the way to work! From the hands of scientists to your spoon. 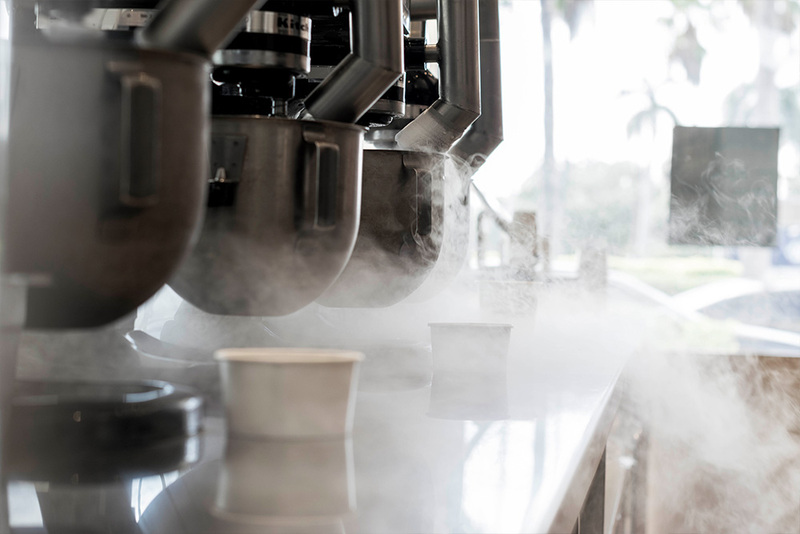 At Chill-N of Aventura, we spend the weekends blending and flash-freezing your original recipe of fresh ice cream or frozen yogurt, and the rest of the week perfecting our technique and creating new flavors and mix-n’s. When you visit our ice cream and frozen yogurt shop, you can enjoy a bowl of made-to-order ice cream, flash-frozen right in front of you. All it takes is six simple steps, with three difficult choices. First, the difficult decisions — you really can’t go wrong, they are all uh-ma-zing! Check out the Periodic Table of Flavors for all of the choices. Pick your base — classic ice cream, delicious frozen yogurt, or a dairy-free option. Pick a flavor - our coffee flavor is made from Miami-fresh coffee! Add in some mix-n’s — one, two, go nuts! Then, we will take it from there. Then, watch from a safe distance, while we use the magic of science (and liquid nitrogen), to flash-freeze it. Enjoy the taste of the smoothest, creamiest, freshest ice cream this side of the Atlantic Coast. And, if you want to share the joys of flash-frozen nitrogen ice cream as much as we do, talk to us about profitable franchise opportunities!